The SERC 2019 3 PEAKS CHALLENGE will take place on Sunday the 7th of April starting and finishing at the Arklow Rock Parnells GAA club, Emoclew road, Arklow, County Wicklow. The SERC 3 PEAKS CHALLENGE is a great warm-up for the Wicklow 200 with spectacular views as you cross two of Wicklow’s best known climbs, Slieve Mann and Shay Elliott, plus a few more !!. This promises to be a great event in the heart of the Garden County. 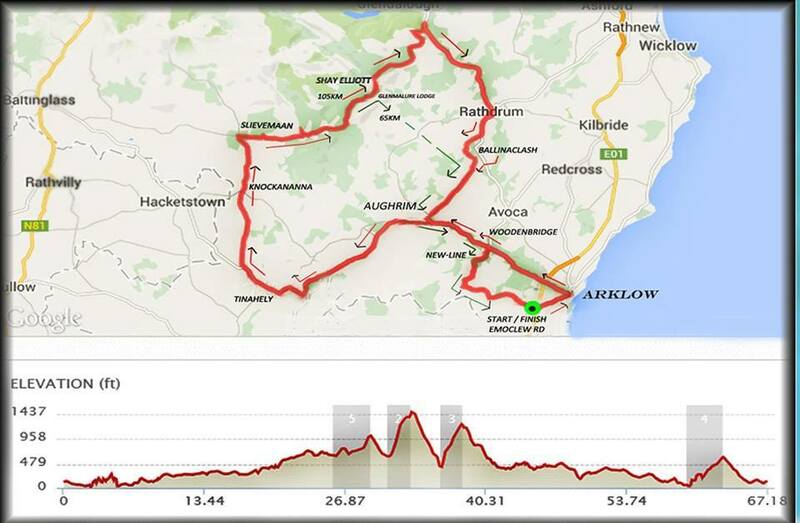 There are two challenging routes, all starting and finishing in Arklow. As the event numbers are limited to 300 it is advised to sign up online as soon as possible , however if there are any places left open on the day the fee will be €30 for CI licence holders. Please note it is mandatory to have a 2019 Cycling Ireland licence. One day licenses will be available on the day at a cost of €5. There will be a Water and Food-stop at Glenmalure Hotel car park ( 55km approx )and we will have Refreshments before and after the event at Arklow Rock’s GAA club from 8:30am to 4:00pm for participants. A repair/ breakdown service will be available on the day but you are encouraged to have your bike serviced beforehand. We will also have a large contingent of experienced event marshals, lead cars, Ambulance, mobile repair/ breakdown service and a broom wagon on duty on the day of the event. Participants can start before the official start time however the Support Vehicles, Marshals, Water and Food Stop will not be available until the official starting time.